Due to the recent changes regarding kingsnake.com , specifically the forums, and the changes yet to come, this guide is currently in the process of being updated to account for the changes. Please bear with us during this transitional time. kingsnake.com thanks you for your patience. 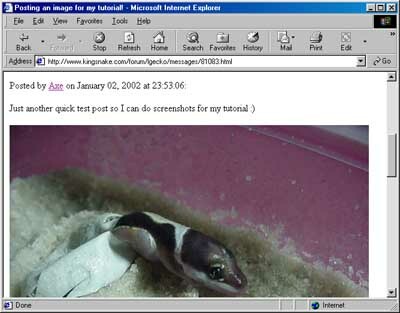 Posting images in your messages on kingsnake.com is relatively simple, once you know how. This quick little tutorial will attempt to show you how, using the kingsnake.com free image hosting service, to include images in your posts. That bit was easy. The next bit is also easy, but is the bit that can take a while to figure out unless somebody shows you how. This technique also differs slightly depending on whether you use Netscape or Internet Explorer. 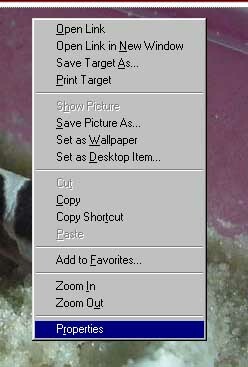 You need to click on the image right your right mouse button so that a popup menu appears like the one below. Once hte menu appears, you select "properties". The properties screen will give you a bunch of information about your image, including the URL (Uniform Resource Locator - or "Web Address") of that image. This is the bit you need. Rather than trying to remember this, or writing it down, you can "Copy" it, and then "Paste" it into your message when you need it. The properties screen looks like this. 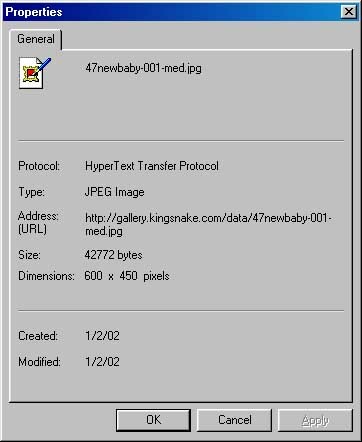 Once you have the properties screen up, you need to right click on the Address of the image (That's the bit that starts off "http://gallery.kingsnake.com") and click on "Select All" when the menu comes up. You will see the entire string is now highlighted. 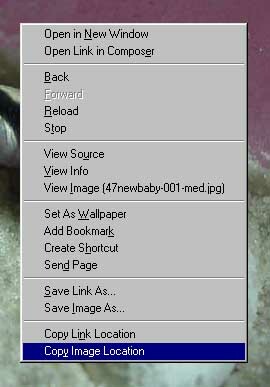 Right click on it again, and when the menu pops up this time, you select "Copy", as below. This is even easier than in Internet Explorer. Upon discovering the location of your image, all you have to do is right click on the image, and when the popup menu appears, you select "Copy Image Location" as below. 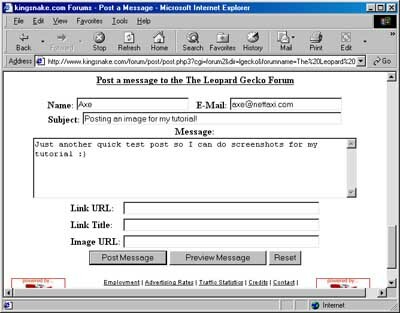 Now whichever browser you use, and the appropriate method used, the address is stored in Windows' memory, and can be "pasted" into messages, or other applications, such as "notepad" or your E-Mail software when composing a message. We have reached the time to head on over to the kingsnake.com message forums. 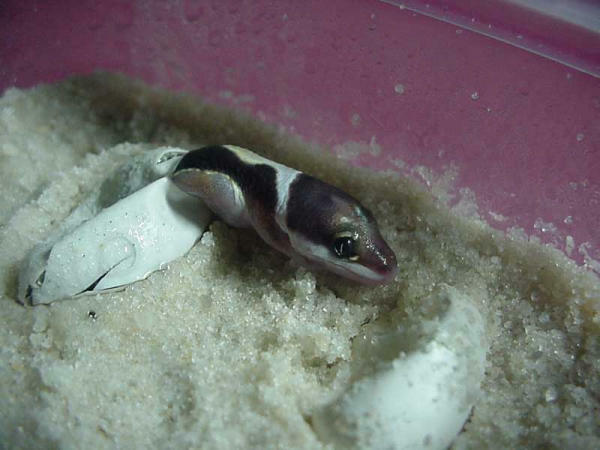 For this example, I'm going to use the Leopard Gecko forum (seeing as the pic I've selected is a leopard gecko hatching out of her egg). Using the HTML method, here is a screenshot of the message after it has been posted. I received an E-Mail asking me how to post multiple images in a single post on the forum. This can only be done using the HTML method, and is just as straight-forward as posting a single image. All you have to do is put them straight after each other. Page content & all images are copyright John Aldred ©2001-2002. 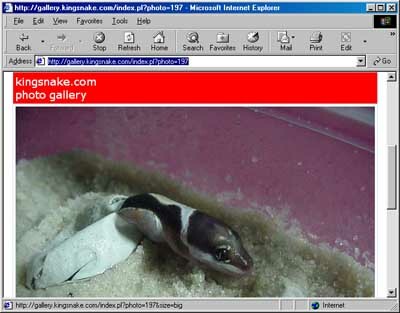 kingsnake.com is Copyright OnlineHobbyist.com ©2002.